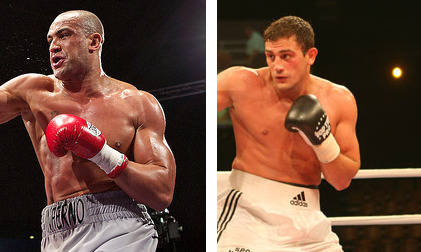 German SES was the sole bidder for EU heavyweight champ Richard Towers’ defence against Francesco Pianeta in today’s purse bids held in Rome. SES bid 33.550,00 EUR and have set January 20 as date for the fight with site to be announced. Pianeta, 28-0-1, held the EU title 08-09 when he was promoted by Sauerland but was forced to relinquish the title when diagnosed with skin cancer. He then left Sauerland for SES in 2011. Towers, 14-0, won the vacant title with a stoppage win of Frenchman Gregory Tony this past summer. French jr middle champ Jimmy Colas, 31-9, defends the title against Frederic Serre, 13-7, on Thursday (Nov 29) in Enghien in a highly interesting fight between two fighters with losses in their respective last fights. Serre lost on a controversial cut eye stoppage against Jack Culcay in August in Berlin in a fight for the WBA I/C title. Frederic was badly cut but what had caused the cut appeared to be a matter of dispute ringside that night. The referee ruled the damage had been caused by a punch and Serre was declared a tko loser in a fight that was even and exciting at the time of the stoppage. Colas was downright disappointing in losing to Jackson Osei Bonsu in Belgium in September in a fight for the EU title but was apparently plagued by a foot injury and problems making weight. So on Thursday we see a crossroads fight between two men with a lot to prove. 8M Boxen with Halle an der Saale, Germany, as base promotes a show at home December 21 headlined by welter prospect Roman Belaev, 9-0 (8). Belaev impressed in stopping decent Latvian journeyman Semjons Moroseks last time out but is this time in against Franck Haroche Horta, 29-9-5, and the Frenchman is likely to test Belaev to the limit despite an upset second round tko loss to Jimmy Colas last time out. Haroche Horta, a tricky southpaw, have in his short career fought all over Europe at a busy pace with good results and is the best opponent Belaev have faced this far.